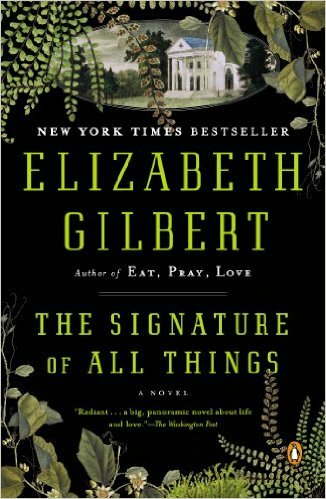 Because I never had any interest in the massive bestseller Eat, Pray, Love, I paid little attention to Elizabeth Gilbert's new novel, The Signature of All Things. Then the extraordinary reviews pulled me in, and I finally read this remarkable book about the life an imagined 19th-century woman botanist who travels the world after a constricted life on an American estate. The science was fascinating, but the writing itself and the story wouldn't let me go. Two years ago I gave up hosting a nationally-syndicated author interview radio program that I'd hosted for fifteen years. This is the first book that has made me wish I still hosted the program, so that I could speak to the author.